Not only are nasturtiums fast and easy to grow, these edible flowers look and taste good, too. In fact, nasturtiums are so easy to grow that many home gardeners overlook them. The plants grow well in full sun or part shade, and bloom all season. And you can eat almost the whole plant. What more could a gardener ask for? 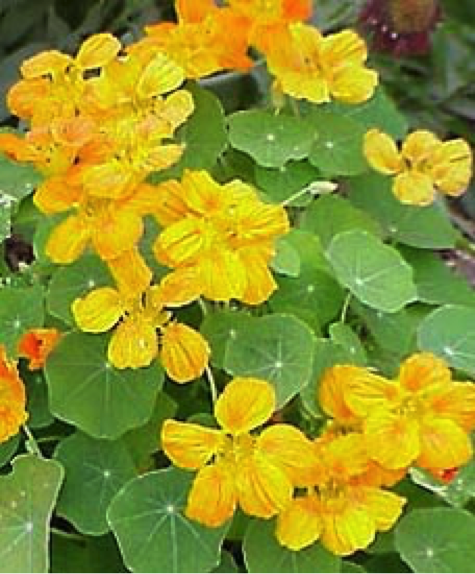 The nasturtiums home gardeners know and love are the two most common species: Tropaeolum majus, the trailing type, or T. minus, the bush type. But note that some bush varieties trail a bit, and some trailers are less vigorous than others and almost bushlike. Although most often grown as annuals, nasturtiums are botanically herbaceous perennials; that is, they die to the ground in fall and grow again the next spring. In frost-free areas such as coastal California, they can grow like weeds, with 6-inch diameter leaves atop 20-foot-long stems sprawling year-round. When you're choosing varieties to grow, first decide whether you want bush or trailing kinds. Consider the unusual double flowers of the camellia-like types, too. In addition, some varieties have variegated foliage that's attractive even when the plant is not flowering. Trailing Nasturtiums. These nasturtiums have bigger flowers and leaves but don't produce as many flowers as the bush varieties do. They look great in hanging baskets, sprawling on a bed like a ground cover, or cascading over the edge of a raised bed. A vigorous trailing type, such as 'Tall Trailing Mix', can be trained on a fence as a climber. 'Jewel of Africa Mix', another notable trailing type, features variegated leaves and a colorful combination of flowers. Bush Nasturtiums. 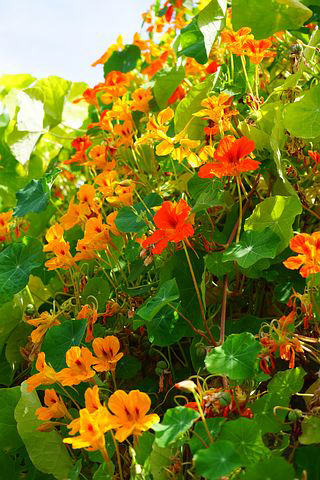 Bush-type nasturtiums look great in window boxes and containers, or edging a path or border. The variegated 'Alaska Mix', is a good example. Although it's not as floriferous and vigorous as other bush varieties, the vivid leaf markings of 'Alaska' more than make up for its meager flowering. Flower Forms and Colors. Some blends, such as 'Whirlybird Mix', offer a mix of flower colors, but single colors are also available. The vermillion red flowers of 'Empress of India' contrast beautifully with its blue-green leaves. Although listed as a bush form, this one tends to trail to 1 to 2 feet long. 'Moonlight' (yellow and trailing) and 'Salmon Baby' (salmon with a bush habit) offer more dramatic, single-hued flower color. Not only are nasturtiums versatile and colorful, they also are easy to grow and thrive on neglect. The large seeds germinate within a week and begin to flower about a month later, making them great choices for children or beginning gardeners. Sow in the garden about a week before the last frost date for your area, or in frost free areas wait until the night temperatures are evenly in the 50°F (10°C) range before starting them directly from seed outdoors. They can also be started indoors, but their taproots make them difficult to transplant. Nasturtiums flower best in full sun. In hot-summer areas, provide some afternoon shade, or cut them back in midsummer, and allow the plants to regrow for a fall flower show. 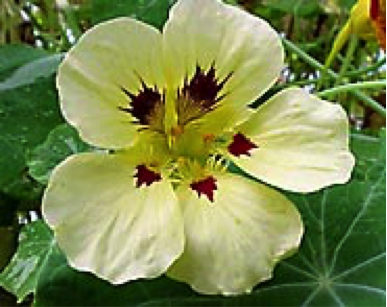 For best flowering, grow nasturtiums in well-drained soil. They don't like excessive fertilization, especially nitrogen. If the soil is too rich, the plants will respond with large leaves and fewer flowers. Aphids are the main pests, but they seldom harm the plants unless it's a major infestation. Check the undersides of leaves for aphids, and eliminate them by spraying the plants with insecticidal soap. Adding flowers to food has long been a custom in many cultures around the world. For centuries, Chinese cooks have used lotus, chrysanthemum, and lily flowers or buds in their recipes. American colonists added marigolds to mutton broth. Nasturtiums, among the best-known edible flowers, are popular with chefs. Not only do they dress up a plate, but they're high in vitamins A, C (ten times as much as in lettuce), and D. The leaves, flowers, buds, and seeds are all edible, with a peppery flavor that adds a zing to any dish. Before harvesting a whole patch of nasturtiums, taste a few flowers first. Their flavor may vary depending on the plant, and on soil and weather conditions. Generally, the more stressed a plant is (by lack of water or nutrients, or exposure to adverse weather), the more pungent its flavor. When harvesting the leaves, select young, tender ones. Harvest buds or fully opened flowers in midmorning, ideally on a cool day. The entire blossom is edible, but if you find the organs inside the petals to be bitter, you can remove them with scissors. Gently wash and dry the flowers and leaves, and store them in a plastic bag in the refrigerator. In the kitchen, add the flowers to green salads and as a garnish for stir-fry dishes. The petals make colorful additions to potato salads. Flowers are delicious accompaniments to salmon and shrimp. You can also stuff them and cook them with pasta. Handfuls of intensely colored nasturtium flowers can be added to bottles of apple cider or plain vinegar to give them a lovely jewel-toned color.